Brandy - I have never sweat this much. Ever. Gage - Models of Dinosaurs? That nice, but I'm ready to get back to the car. Emerson - Dad? I want to see the fat hippo. Down at City Center (the local mall) it is easy to miss your bike in the lot. .. .. .. This is only about 1/3 of the two wheeler parking space, B and I just went for lunch on a Wednesday in the mall food court. These pictures are from Sunday April 22, 2006. 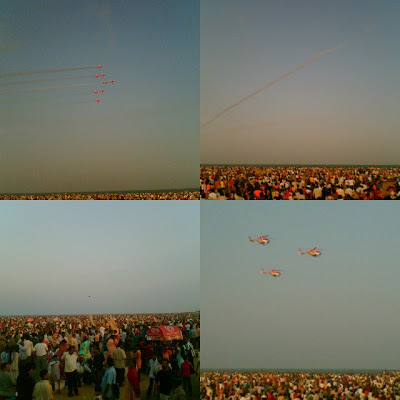 Chennai put on an airshow at Marina Beach, and over 550,000 people came to watch. That is almost as many as ALL THE HUMANS IN WINNIPEG!!! 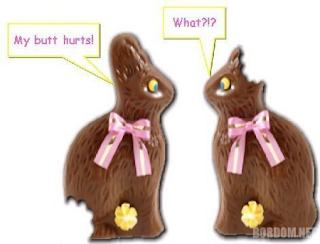 Brandy -- You are RAD! It's great to be 30. My nose hair is long but I have a little thing to clean up in there. Aaahh the tranquil Saturday morning. Most of the kids are sleeping in, eating sweet cereal or watching violent cartoons. Anywhere but in the pool, and this small window in time is the perfect moment to float on a blowup toy. Its huge. It feels like home. It is back online. Damn you HP for your crappy Indian support. Thank you for the power adapter from Canada. but a little too small. And outlook exchange doesn't like you. So our love affair must end. Gage put on my hat last night and he looked so darn cute I had to take a snap - he looks all grown up! It was great to have you here, hope your trip was all worth it and you have many stories to tell - pass some of the Indian heat to everyone back home! I hope you find your luggage. And Happy Birthday little Sister! 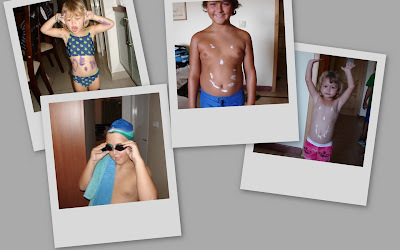 After an awesome week of relaxation we are back online; all tanned and feeling recharged. We spent our time on the beach of GRT Temple Bay in Mahamallipuram and in Pondicherry. The beaches were nice, with brown sand and nice waves - Gage spent the most time in the water and we all had lots of fun getting tossed around in the water. This shot is of the beach, ocean and fishing boats. It reminds me of being there and makes me relax. And when we got tired of the waves the pool welcomed us, this is really one of the nicest pools I can remember. Pondicherry - the French Quarter - this place was ruled by the French (as opposed to the British) before India took back their own rule. It was really different than Chennai and I totally had fun. There are a lot of shops to browse and great food to enjoy. This shot is of Gage on the pier, we just went for a walk and he called it 'attack the beggars' because we were asked for money by about 20 people in about 20 minutes. There are alot of street vendors with stuff to buy like food, baloons, peacock feather fans, drums, and other stuff - these guys are really persistent and Gage has become a pro at warding them off. Here Grandma is getting asked for money by a haggard mom and her super cute kid, she was entranced by the cute bum and was dying to give some rupees to her. The streets were lined with little bunnies holding the dustbins; the cute kids were glad to pose for the camera.